Mint Royale was dreamt up by a Tasting Club member and has gone on to be more highly rated than some of our bestsellers. It’s on its way to chocolate stardom – but how did it get this far? The Tasting Club reviews say it all: newcomer Mint Royale is a star in the making. But it’s not of our making – it’s a past winner of our Create-a-Chocolate competition, and one with a bright future. So how did this plucky upstart make the transition from sketch to box? Choosing a winner is a serious business: our co-founder Angus Thirlwell makes the ultimate decision, with input from our master chocolatiers. In Mint Royale’s case, it was the texture and the visual of the double-layer caramel and white ganache that tipped it for the top – plus our experts had an inkling the design would really deliver on the peppermint flavour. There were some deviations from the original concept though: the design called for the mint layer to be bright green and the edge of the chocolate to be milled, to give the impression of a coin. Every Wednesday morning Angus sits down with the chocolatiers and a crack team of tasters to vote on which chocolates make it to further development. This was the first real test for our would-be recipe. Just like that, our wannabe was officially ready to leave the inventing room – as a featured recipe in our Tasting Club boxes. It wasn’t just our panel who loved Mint Royale at first bite. As soon as our 70,000-strong Tasting Club membership tried it, the scores began to flood in – and they were resounding. The Tasting Club had spoken, and we took notice: it was time for Mint Royale to graduate to our shelves – and its own Selector. The journey from Tasting Club to Selector isn’t as straightforward as it seems, and our chocolate needed touching up before its big debut. The solution? Simple: swap the peppermint oil from the white chocolate ganache into the thick caramel – that way the flavour profile was maintained sans the leakage. What does the future hold for our up-and-comer? We anticipate success on the scale of bestselling Create-a-Chocolate competition winners like Eton Mess. 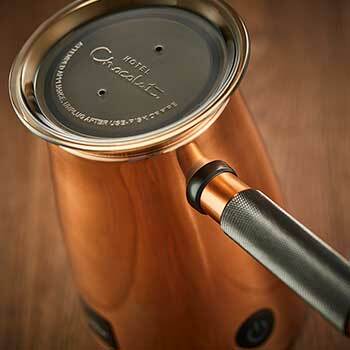 Mint Royale comes to Selectors this August – keep an eye out at your nearest Hotel Chocolat shop!